The waiting room is one of the most important spaces in a healthcare facility. Unfortunately, it’s where patients and family members tend to spend the most time – and many say that time spent waiting is the worst part of going to the doctor. Recent research directly links long wait times with negative HCAHPS scores, meaning that a poor waiting experience can negatively impact reimbursements. Facility professionals today can focus on some key areas to improve the waiting room for patients and their families, and in turn help transform the overall patient experience. Waiting spaces should be designed to accommodate everyone safely and comfortably. That might mean chairs with a higher weight capacity for larger patients or with a higher seat height for those who cannot easily get up. Long rows of ganged seating are often not comfortable or accessible for those with physical limitations. Those who are mobility impaired, obese or pregnant often have trouble getting in and out of standard chairs or walking down crowded aisles. Aisles should be wide with plenty of space for someone using a wheelchair or walker to maneuver easily. When planning the furniture layout, be sure to leave spaces for wheelchair parking. Safety also means keeping infection control in mind. When possible, sick and well patients should have separate waiting areas, especially in pediatric spaces. Textiles and surface materials should be non-porous, have as few seams and catch points as possible, and should have the ability to withstand repeated cleanings with harsh disinfectants. On furniture pieces, a clean out space between the seat and back will help any debris fall to the floor and provide easy access for regular cleaning. Patient comfort goes far beyond a cushy chair – the entire space has the potential to contribute positively to patient well-being and experience. Natural lighting and views to the outdoors are desirable and can be supplemented with table lamps and full spectrum overhead lights. Providing a mix of seating styles also can improve patient experience. In addition to standard seating arrangements, consider offering chairs with tablet arms or pull-up tables to allow people to work or complete needed paperwork while waiting. Furniture with integrated power ports allow patients to recharge devices while playing games or watching videos. When possible, provide a quiet area free from music or TV noise for those who prefer solitude. Benches near entry doors create a safe place to wait for transportation or a companion. Carefully chosen artwork has the power to soothe and inspire. Nature imagery has been shown to alleviate stress and provide a positive distraction for viewers. Consider soft, soothing wall colors that coordinate with the rest of the room, creating a sense of harmony and balance. Furniture arrangements should allow for clear lines of sight to the reception desk or doorway to treatment spaces (or both). Patients want to ensure they aren’t “forgotten” and those with visual or auditory limitations want to ensure they aren’t missed. Personal space, especially when patients may feel especially vulnerable due to illness, is very important. Chairs with wide armrests, or small in-line spacer tables can provide a personal “bubble” without taking up excessive floor space. Many waiting spaces are incorporating amenities that help visitors feel welcome and comforted. 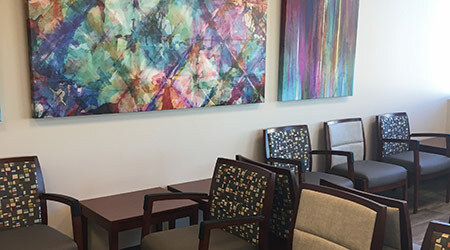 Refreshment areas offering water, coffee and tea help patients stay hydrated and offer the opportunity to relax before seeing a healthcare provider. Having free Wi-Fi can keep both young and older visitors distracted during a longer wait. If there are children frequently in the waiting space, providing a small activity area can help keep them occupied and calm. Look for tables with built-in puzzles or games where pieces cannot be lost or removed. Everything should be easy to disinfect and wipe down. Don’t forget accents like magazine holders, trash bins, wall clocks and directional signage. Depending on the patient population, bilingual signs can help all patients feel comfortable and welcome. Every waiting area has the opportunity to significantly affect the patient experience, both positively and negatively. With a clear focus on safety, comfort and making all visitors feel welcome, the waiting area can both improve patient mood and HCAHPS scores. Joanna Terry, director of healthcare sales at National Business Furniture, is a healthcare and design professional with more than 20 years in the contract furniture industry.